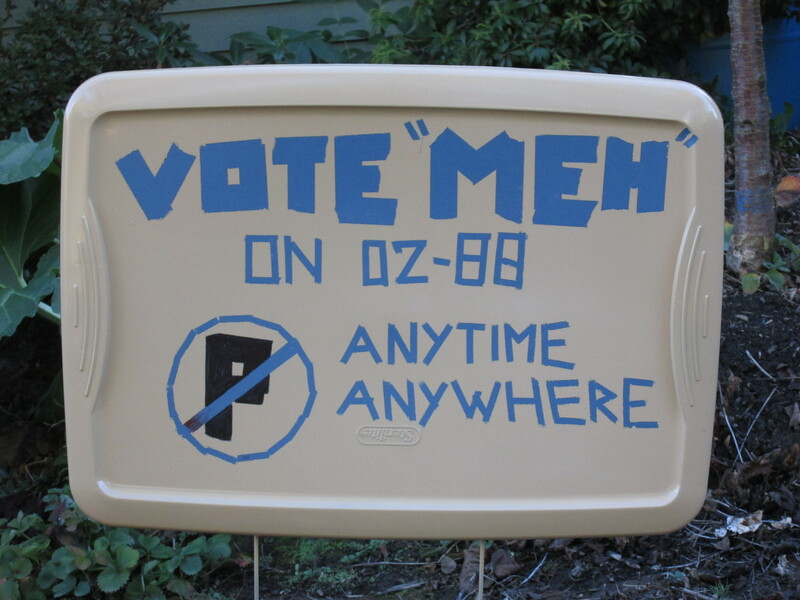 CORVALLIS – A Facebook friend recently asked her peeps what they thought of Measure 02-88, which proposes new parking districts for the neighborhoods around campus. She doesn’t live in the areas affected and wanted to know what people were living with so as to better inform her vote. Much like my neighborhood email list, the responses were varied and often dramatic. Complaints include students up at all hours of the night, streets crammed with cars and a general decline in livability. Anger is directed at OSU, developers and city codes. Though I live in the area affected, and do indeed become weary of the student influx each fall, I am even more fatigued by the outrage. The “Corvallis Effect” is in full swing, as the not in my back yard mindset rises to the top and offers solutions that aren’t based in reality at best and are hypocritical at worst. One suggestion offered up was for the churches close to campus and in the affected areas to rent out their parking spaces during the day. Several people were congratulated for their forward thinking. And all I can say is are you serious? Why don’t you rent out your driveway when you’re at work? While one of the more vocal proponents of the parking measure complains about not having space to park in front of their home, they have a two car garage and driveway they don’t use for their cars. Another neighbor has their driveway full of planters and a year round pile of bark mulch. I have never seen either of their two vehicles parked on their driveway. This, of course, fell on deaf ears. Perhaps the “best” example of a herd-like non-reality based refrain is that we need to reduce our reliance on the automobile as a valid reason for the parking districts. More bike parking and better public transit, and everyone will magically use their bikes and take the bus. And they somehow believe this will happen if we provide parking for some (residents) and not others. This is NIMBY logic at its finest. Or, possibly, it’s worst. My response is this: the surest way to de-incentivize the automobile is to make it inconvenient for everyone. What has been driving me batty of late are the critics of the Benton Center, who keep talking about public transportation or biking to solve parking issues. It rains, a lot, in Oregon from October to April. Biking isn’t a great option, especially when many attending classes at the Benton Center are going back to school and still working. They don’t often have time to rely on public transportation to get to and from work or home midday, much less at 9 or 10pm. Yet discussion recently in a neighborhood group had several rendering Measure 22-130 to a no vote. A reason given; “As much as I am pro-education, I am also against wasting money on parking.” This from someone living close enough to walk to the Benton Center, but who also admitted to driving. Oh, the irony. These are views arising from within an incredibly insular bubble. They keep suggesting that LBCC or OSU needs to think more creatively, but they can’t change the habits of others. The need for adequate automobile parking is not going to go away. They are guilty of mislabeling our parking issues and everyone else not in agreement as somehow selfish. Yet what are people complaining about when they can’t park in front of their homes if not their own inconvenience? So, dear Facebook friend, I am voting no on 02-88. I moved to this area to be close to downtown, shopping and schools. I’ll take the good with the inconvenient. This entry was posted on October 23, 2014 by A.J. Simonsen in Corvallis and tagged 02-88, corvallis, corvallis effect, districts, measure, nimby, no, parking, vote.